The protagonist of K.O.L.M., the new experimental platformer by Armor Games' Tony (Antony Lavelle), wakes up to find that his life is in pieces. He's disorganized, his mother is ashamed of him, and it seems like the whole world is out to get him. It doesn't help that, after the events of last night, his vision is blurred and he can barely walk. The fact that he is a robot and that the mother is a sardonic computer is almost besides the point. He needs to escape. And maybe, just maybe... you'll be able to help him out. Players might be initially thrown by how K.O.L.M. drops you into a blurry world of uncertainty, but after a couple of minutes, things will become much clearer. Using the [arrow keys] to move around, you explore the ominous facility around you, fighting enemies, unlocking doors and finding your missing parts. Finding said parts grants you new moves, including springs that allow you to jump with the [z] key, a compacter that allows you to duck with the [down] key, a plasma gun fired with the [x] key that can be used to defeat enemies and open doors, and as well as others upgrades that allow you to broaden your range. Of particular note is the jet-pack which, with a double tap of the [z] allows you to reach new heights as well as aiding you in being launched from air vents, as well as a dash function which, with a double tap of the arrow [keys] allows you to speed around the complex making longer jumps than ever before. Good luck pulling yourself together, bot! Analysis: The Japanese have a word, Utsuge: a portmanteau which literally translates as "Melancholy Game". I bring this up because it is probably the best description one can give of K.O.L.M. It is a game of melancholy; of inadequacy; of the feelings you get when you're trying to impress someone you love and admire, but aren't sure if you'll ever succeed. These are themes rarely explored in casual games, especially platformers that star jet-packing robots. That K.O.L.M. manages to do so so well, and with a proper dose of both humor and arcadey action, is to its credit. One thing about K.O.L.M. that isn't particularly innovative is it's unabashed use of the "Slightly Deranged Computer Guiding You Through A Post-Apocalyptic Test Chamber". This is a trope I'm kind of surprised we don't have a catchy genre term for yet, considering how often we're seeing it. Yeah, Portal only came out three years ago and the internet (myself included), isn't yet entirely sick of keeping on trying till we run out of cake. Still, while K.O.L.M. itself distinguishes itself from the pack by playing its overseeing robotic "Mother" for melancholy, rather than humor or terror, I wonder if the concept is beginning to be a bit of a crutch for experimental game designers. K.O.L.M. won't be for everyone. It starts off off slow, with a crippled protagonist that can barely crawl. The initial weirdness, slightly finicky controls, and creepy music will probably turn some people away. Those who persevere, however, will find a quiet gem of an experience with a surprising amount of depth in its simple design. I expect K.O.L.M. to be a strong contender for the Best of 2010 in the Platform game category. Death simply sends you back to the entrance you came in via. The "Lives" counter actually counts how many lives you've used so far, i.e. how many times you've died. Enemies do not respawn when you do, so if an enemy kills you, you won't have to deal with him again (unless you come back to the room later). The game autosaves so you can just quit. N.B. When just walking back through previously explored simple rooms, I may simply list the exit you need to take. 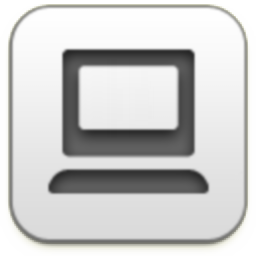 Camera 41: Shuffle to the right with the arrow keys until you change screens. Camera 40: Continue shuffling right until you reach the power-up sparkling in the centre of the room. Camera 41: Walk right, drop down and exit by the bottom left of the screen. Camera 39: Drop down to the very bottom of the room, and then exit by the bottom right. Camera 0: Run straight across this room. Camera 1: Drop down and exit via the bottom left. Watch out for the white blurs in the bottom right, as they are spikes. Camera 2: Walk left and drop down onto the next powerup. Camera 2: Walk right dropping past the spikes out of the bottom right exit. Camera 3: Drop down and grab the powerup in the centre of the room. Camera 3: Jump back up and exit the way you came in. Camera 2: Jump past the spikes to exit at the top left. Camera 4: Head straight through this room and exit on the left. Camera 5: Jump over the gap above the spikes, then fall past them and walk out the bottom right. Camera 6: Watch out for the robots crawling along surfaces as they will kill you in one hit. Drop down avoiding the spikes to exit via the middle left door. Camera 7: Jump over the spikes and crawlers; fall into the middle to grab the powerup. Camera 7: Shoot out the blue forcefields to clear the way back out of this room. You can also destroy the crawling robots if they get in your way. Exit the way you came in. Camera 6: Make your way back to the top left exit. Camera 5: Jump back up, shoot the forcefield out and then exit by the top right. Camera 2: Top Right exit. Camera 1: Top left exit. Camera 8: Jump up to the ledge above the door. Jump across the arrowed platforms, taking care as they are treadmills, then drop down to the left to grab the power up. Camera 8: Step onto the treadmill on the bottom and duck. You will be pushed to the only door, which you should use. Camera 1: Bottom left exit. Camera 2: Bottom right exit. Camera 3: Bottom Left exit (destroying forcefield). Camera 38: Shoot out all the forcefields to exit on the left. Camera 6: Avoid water; it is currently deadly. Jump over the gaps to near the left edge of the screen, then drop down to just above the water. Then jump to the right, avoiding the water and crawlers to exit at the bottom right. Camera 9: Drop down avoiding the crawlers and spikes to exit at the bottom left. Camera 10: Walk left, ducking to avoid the shots. Jump over the turret and exit top left. Camera 11: Drop all the way down this shaft. Camera 13: New enemies, seekers. These fly towards you when you get too close, but die on their own if you avoid them for a few seconds. Dodge the seekers, exit bottom right. Camera 18: New enemies, bouncers. These bounce around at random getting in your way. Shoot them. Shoot the bouncer in your way, and exit bottom left. You don't need to provoke many enemies for now. Camera 20: Dodge the crawlers and exit bottom left. Camera 16: New enemies: chargers. As soon as you stand in line with them they charge at you until they hit a solid object, which kills them. Either dodge them or trigger them from behind a wall if possible. Shoot the bouncer in the middle of the room from a safe vantage point. Jump carefully past the spikes and up to the left to grab the powerup. Camera 16: Dash jump over the spikes to exit by the top right. Camera 20: Top right exit. Camera 18: Top left exit. To avoid the enemies you can dash jump left from the tip of the mound left of the water straight out of the door. Camera 13: Top right exit. Camera 14: Shoot the bouncer in the middle of the screen, then exit top right. Camera 15: Jump up and dash jump over the spikes to grab the powerup. Camera 15: Bottom left exit. Camera 14: Bottom left exit. Camera 13: Bottom right exit. Camera 18: Dodge the enemies around the room, and drop into the water. Navigate around to the bottom and kill the bouncer. Exit bottom left. Camera 19: Drop down while avoiding chargers and exit bottom left. Camera 21: Grab the powerup right in front of you. Camera 21: Top Right exit. Camera 19: Top Left exit. Camera 18: Head over to the bottom left exit. You will need to dash jump to get up on some of the underwater ledges. Camera 20: Bottom Right exit. Camera 21: Crouch and slide through the tunnel to the bottom right exit. Camera 22: Walk right and drop into the large area. The faint platforms will fade after you stand on them for a few seconds, then reappear shortly after that. Another robot similar to you will attack you. He will shoot similarly to you and run around. You need to shoot him 3 times to defeat him. Deaths will make you respawn but the enemy robot keeps the same health. He will drop a powerup. Camera 23: Double jump out of the battle area and walk around to exit bottom right. Camera 24: Jump into the fan to get pushed up to the top left exit. Hold jump while being pushed to gain more height. Camera 19: Jump up through this room, avoiding chargers. Double jump is very useful here to avoid enemies and shorten your path. 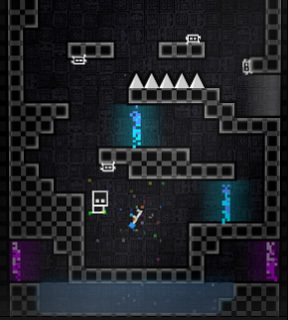 Camera 22: Jump up to the top left exit, avoiding the enemies. Camera 17: Slide through the narrow tunnel and exit left. Camera 12: Double jump up and jump into the fan. You will need to hold the jump button to gain enough height to reach the top ledges. Jump the rest of the way up and out top left. Camera 9: Slide through the narrow tunnel and exit middle left. Camera 6: Dashing and double jump can save you a lot of time while backtracking. Exit top right. Camera 3: Exit top left. Camera 2: Exit top right. Camera 1: Jump up using the jetpack to reach the powerup in the top of the room. Camera 1: Exit bottom right. Camera 2: Exit bottom right. Camera 3: Exit bottom left. Camera 6: Exit bottom left. Camera 25: Avoid the bouncer and jump up to just below the narrow tunnel. Wait for the cannon to fire, then slide through as quickly as possible. Avoid the rest of the cannons and exit top left. Camera 26: Dodge the chargers and cannons and exit at the top left. Camera 27: Avoid the many enemies in this room and jump over the tunnel with forcefields at either end. Exit left. Camera 28: Drop down, avoiding the chargers, then the cannon fire. Exit bottom right. Camera 31: Jump through the enemies (or persist until they've all died) and grab the powerup. Camera 31: Exit top left. Camera 28: Exit top right. Camera 26: Avoid the chargers and dash against the conveyors to get back over to the right. Drop down and exit bottom left, avoiding cannon fire. Camera 29: Drop down through this room, walking and dashing against the conveyors to avoid falling into the spikes. Exit bottom left. Camera 30: Slide straight through the tunnel and exit left. Camera 31: Drop down, avoiding the chargers and bouncers. Swim all the way down to the bottom right exit. Camera 32: Avoid the swarms of bouncers and make your way around to the exit bottom right. Camera 33: Ride the fan up to the top and drop into another robot fight. Again, hit him 3 times to defeat him. Grab the powerup he drops. Camera 33: Triple jump up and drop into the next battle. This time you will have to dash against the conveyors in order to move around. Get 3 hits in and then pick up the powerup. Camera 33: Destroy the yellow force field, then drop down for the last battle in the room. Only 2 hits this time. He may start firing before you enter the arena and will hit you if you enter too slowly. Grab the last powerup. Camera 33: Crawl through the narrow tunnel and fall onto the now harmless spikes. Exit right. Camera 34: Drop through this room, ignoring the enemies. Exit bottom left. Camera 42: If you grab the powerup in this room, the final sequence will start and the game will end. However loading after this will bring you back to this room before the sequence happens. This is the best time to go secret hunting as you now have everything. Shoot out the yellow forcefields and jump up to grab the powerup. A countdown will start, and you need to escape. It's not very tight, and if you fail you either respawn outside this room or nothing happens and you continue escaping. This seems to be a bug. The escape is trivial as you can now jump very high and cannot take damage. Dashing frequently helps with the time limit. I will list the shortest route out: Please see the spoiler. Camera 42: Exit bottom left. Camera 36: Exit top right. Camera 37: Exit top right. Camera 31: Exit top right. Camera 7: Exit bottom right. Camera 6: Exit top right. Camera 1: Exit Top left. Camera 39: Exit top left. N Plate: No powerups required other than access to Camera 10. Bottom right of room. O Plate: No powerups required other than access to Camera 13. Bottom right of room, under a block; you can pick it up just by walking next to it. F Plate: No powerups required other than access to Camera 16. Bottom of room. Trigger and dodge the chargers, then grab from near where they started. D Plate: Jetpack required. Camera 12, ride the fan up and drop onto the ledge on the left about halfway up the shaft. D Plate: Jetpack and Slidepack required. Camera 38, jump up on the left side and slide through the narrow tunnel to the middle alcove. O Plate: No powerups required other than access to Camera 34. Very top of the room, just above the cannon fire. I Plate: Jetpack upgrade required. Camera 36, top left of room. Triple jump up the narrow column to grab it. R Plate: Jetpack upgrade required. Camera 32, left side of room, lower floor. Jump up through the narrow column and land on the temporary block. Jump again to the very top to grab it. T Plate: No powerups required other than access to Camera 30. Jump up to the top middle of the room, avoiding cannon fire and seekers. The powerup is directly above the middle platform. M Plate: No powerups required other than access to Camera 26. Powerup is located in the small alcove between the seekers, under the conveyor. K Plate: Plasma Cannon Level 2 (Purple) required. Start in Camera 7, make your way up to the top left exit, shoot out the purple forcefield and exit to Camera 6. Item is then directly in front of you. T Plate: Dash and slide pack required. In Camera 7, dash jump over the spikes near the bottom to land on the small ledge. Slide through the narrow tunnel, then jump up to the small alcove where the item is located. S Plate: Jetpack and slidepack required. In Camera 4, Double jump up to the high ledge, then slide through the tunnel to the item. I Plate: Jetpack and dash required. In Camera 0, starting on the left ledge, dash double jump across to the opposite side of the room. The powerup is on the ledge here.
'' Plate: Double jump required. In camera 40, jump up to the ledge, then drop onto the powerup floating just above the spikes. You will die unless you have invincibility. L Plate: Jetpack and Hydravitor required. In Camera 18, drop into the water and move to the right. Double jump up to grab the powerup just out of the water in the right alcove. Easier with triple jump. E Plate: Slidepack required. In Camera 24, slide down the narrow tunnel in the bottom right corner. K Plate: No powerups required other than access to Camera 22. Directly opposite the top left door, past some chargers. I Plate: Triple jump required. In Camera 20, triple jump up into the cave with 2 seekers in it. The powerup is in the centre. E Plate: Triple jump required. In Camera 28, triple jump up the small chimney in the top left of the room. Thanks to Max for the walkthrough! escape from the site before exploding. I also like the story with the mother and the son at the end where the mother is all like "You killed me. You killed me. You killed me. I hate you", and such. This is one of the best games I've ever played. Wow! Honestly, this is one of the best games I've seen on JiG in a while, motivating me to comment. Like many experimental games, it is "short and sweet," though I think perhaps the developer could have added a little more on. once the Computer starts blowing up... did you know that if you don't do anything, you never die? Like, the timer counts down to 0, then it starts saying "0:0-7", "0:0-8", and so on. Bug? Also, does anyone know what the Computer said? Once it's revealed you killed her as a human. The text scrolls by REALLY fast and it only appears after you start running for your life, so you're kind of distracted. After I retrieved the S tile at Camera 4, the robot won't stop ducking. ...just fixed it by closing the game window and reopening it. The game was well built with the 3D panning screens and pixelated effects. JIGuest, once you get the final item, there's a moment you must press X to continue, leave it like that and read the converstion. At first, I thought K.O.L.M. was just another Tony dud. But as I played through it, it became one of my favorite flash games. It's unique for incorporating Metroidvania into an artesque game and how the story mixes with the gameplay (i.e. going through blurred screens to find your eyes). Very nice game. Hated the ultrasmall screens, but loved the balance. However the ending zipped by a little too quick for me too, and I'm afraid I didn't get the sense of it. So we have this droid with a mother figure (an AI? A real human builder?) who hates it quite a lot even if it is soooo loving a son. The bot upgrades itself a lot, goes through a lot of worries in very strange places, then destroys a... thing. I guess the mother wanted it to, but the reason eludes me. However, the mother now wants the bot dead. Why? The opening song is used in creeper world I guess the song is either open source, they both bought the rights, or maybe the guy who made creeper world also made this game. How am I supposed to get back to the top of the map? I think I've explored all of the green section and I think I should use the shaft with the booster to go back up. However, even with the double jump, I can't quite make the assent. 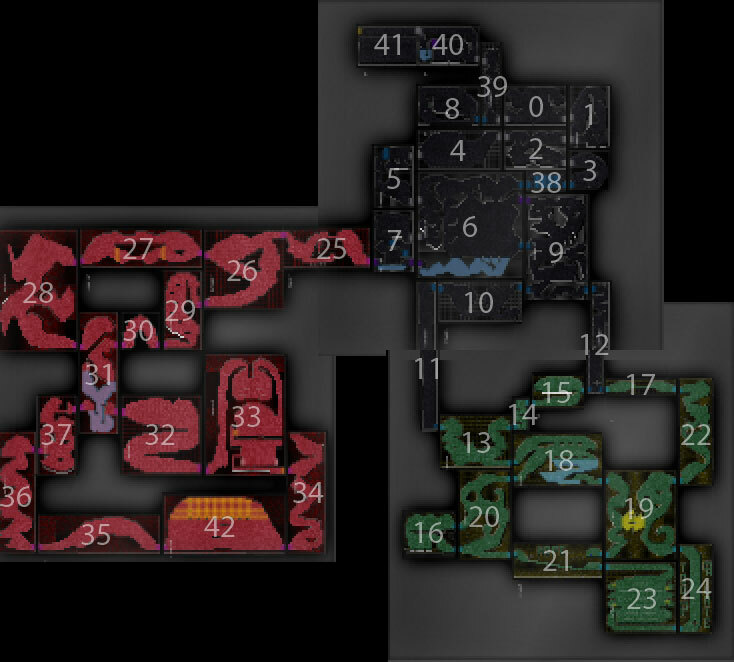 I've gone the through all the rooms in the green section at least twice. Explored every room in the second area, no idea how to get out..
can someone give us a hint? I'm also stuck in the green section. Don't have the double jump yet. Increasingly suspicious that I've somehow got here too soon and will need to start again. I'm stuck with nate8nate. It seems impossable. does anyone know how to move through the crawl tunnels? tried fighting the other robot yet? He's white, and has his own theme music. Once you kill him you unlock the double jump. There are two rooms connecting Area 1 with Area 2. Both are tall and skinny, but one has a geyser-looking thing in it. Jump into that and it'll boost you back to Area 1. Got it!!! You gottta use the ledge sticking out of the wall to "slingshot" close enough to the edge to double jump. Really hard. Good game. Laggy but still fun. If the screen is too small, just zoom in on your browser. Does anything special happen if you get all the letters? like most things in this game, you need an upgrade. Twir - sounds like you're saying that if you get to the green sector before you get the double jump there's no way out. I got the invincibility power-up and then just left the "facility". There was no computer or explosions. How are you guys getting something different? I've explored as much as I can and even have 93% items. Thanks that worked. Would have never figured that out as the instinct was to jump at the peak of boost.. Almost ruined the game for me. How do you make it through Camera 33? The fan won't blow me high enough! look at that, power of the post. into/through the gust of fans lifts you higher. It's not very clear. how to pass the three boss? Unoriginal gameplay, unoriginal music, unoriginal plot, unoriginal upgrade system and unoriginal graphics style condensed into a fresh, unique experience. Too fan higher hold down the jump (Z) button, I figured it out via CaveStory. I think the part where you fight other boss-like robots was a little off since you must shoot them several times and they only need to shoot you once before sending you back to the "lobby". Note that you can shoot up (thank CaveStory). does anybody know how to get "K" part? Okay, I need some help guys. I'm in a red room with two pink doors at the bottom, only accessible through water, but I can't jump high enough in water to reach either door. What am I missing? I've done considerable backtracking and can't find anything I might have missed. Phantastic work. Challenging art, very deep athmoshere. Beautiful. I couldn't work out how to move through one brick high spaces. That is, move whilst crouching. As if you'd need an upgrade for that? Also I became frustrated with the map because I couldn't remember where I'd been or where I'd left things undone due to lack of upgrade, because everything resets once you leave the room. How to fight white robot ? How i can reach him ? @Nemo07, to get the different ending, when you get to the "bottom" of the red rooms, (I think it's Area 3)there will be 3 yellow gates going horizontly, and about 6-8 vertically. Destroy those with you level three laser. get the assuming "power-up" and, ESCAPE!!! The power of posting strikes again. I found the "gravity suit". I'm stuck in a fan on the red set of levels. I can't go up or down, and double jump isn't getting me anywhere. Please help! On some time before, the son, the mother, and the father are living beings. Then somehow the son blowing up stuffs that cause all the three to die (the statement of the son that say'I remember this' after triggering to blow the facility). Somehow after that the mom is reconstructed as an AI and try to make duplicates of this son to be her toy of vengeance( the statement of the son that say'my brothers'). The facility is designed to get rid failed robots and find which one resembles the son. I think you should be able to reach the top part. I really appreciate one piece of adaptive difficulty -- if an enemy (besides a boss, I guess) kills you it won't be there when you respawn (sometimes they don't seem to be there when you reenter the room, others they do). Though I find the combat clunky enough that it's sometimes easier just to lawnmower my way through a room by running into the enemies than to actually try to defeat them; especially those horrible homing things which often don't have the courtesy to come at me from the side with lots of room for me to shoot. What I'm trying to say is, I'm not that good at this. Go to the very bottom of the red zone. There should be a room with loads of yellow 'doors' criss-crossing round an orb-thingy. Shoot the 'doors' (by holding up and shooting), then get the orb. I think the mother coerced the boy into blowing up the facility before, but they only blew themselves up. The mother somehow turns into a computer(? ), forgets how she died, then reconstructs her son into a robot to try and infiltrate the facility again. I would have given this game a 5 had it not been for the laggy gameplay, and off platforming (it was very hard to be precise at all: that bit where you have to get the boost was nigh-on impossible). Oh, and about the music: it's by Kevin MacLeod (check the credits). I know his stuff well: his website is www.incompetech.com, and he does royalty-free music for games and stuff. All the music from Small Worlds was free stuff from Incompetech. I've got some sort of bug. It says I have 100% completion while I play, but when I finish it says 97%. I'm missing the K, but I think I actually got it-one of the tiles supposedly had "" [sic] written on it. P.S. can some one tell me what the end message is at the end please? The dash upgrade is imposssible. No matter how many times I press the arrow keys or how fast I type them, I still walk at a normal pace! Can anyone help me with the first red room (camera 25)? I died at least 30 times trying to get through that tunnel. Am I missing something or am I just not fast enough? arachne - there's no special trick, or at least none that I could figure out. I also died 15-20 times trying to get through it. Duck down on the last possible step before the tunnel, and just after the bullet goes through, scooch through and down as quickly as possible. I'm stuck in the Camera 31 red room, with two pink-doored exits that you have to do underwater jumps onto high platforms to get to. Is there a trick to get to those, or do I need the triple-jump? in camera 18, 19 and 21. I can't jump high enough to get out of the bottom of that pool of water. There's quite a few familiar sounds in this. Pretty sure the get item sound is from Zelda, and the "boss" music is the same as that of the battle music in Sacred Seasons. As for the game itself, it was as the name suggests, kind of like metriod. That said, the game expects you to die a lot more, especially in the boss battles (which are fairly uninteresting and didn't expand on the plot, could have had a bit where he asks why is he killing his brothers and such), and having the screen always zoomed all the way out is sometimes eye-straining. I liked how the screen moves a bit as if you're playing on a gameboy and tilts it towards your character. It's an ok game, but its just lacking in depth and save the melancholy music, background. For the first red room, Camera 25, how do i get past the first laser? Ive tried alot. I was surprised to see this described as experimental, too. It seems like a pretty much by-the-books game with some decent atmosphere. The level design isn't particularly good or bad. The story didn't connect with me, except for a wee bit at the ending twist. The only new idea is having to get an eye upgrade in order to see the game clearly. I think that actually sets the game up to be better than it is, since I was expecting that level of imagination to continue. Instead, the game just keeps giving you predictable power-ups accompanied by repetitive insults from the Mother character. There isn't even any real exploration, since you have to visit every room in a specific order. And the PC's power level isn't balanced against the enemies at all. I'm kind of surprised that this game is so well liked. I guess the basic metroidvania formula is so strong, all it takes is a little atmosphere to make a game with that structure compelling. The nuts-and-bolts gameplay is immaterial. 2D level design is becoming a lost art. Or maybe it was always just a difficult thing to do well. Mother- Oh nothing, my love. Robot- I remember this from before! Hey did anyone else experience this glitch? When I got to that one room (at the bottom of the red place) with all the gold criss crossing I didn't know how to shoot them, so I just kept going. I eventually made it out, and the mother was all like "you may have escaped the facility, but you'll NEVER escape ME!!!" and then the numbers added themselves up (i did really bad apparently) But then I read the comments, and realized i had missed something, so I went back and got that orb thing, and the timers went off, and everything made sense. did anyone else experience that? Please please please let there be an option to turn off effects. I'm on a slower machine (though w/ latest Flash update) and I lost about 20 lives to the FX kicking in mid-jump. Otherwise, brilliant game. Great music choices. Loved the progression of "cameras". Got a little Jungian there, which fit nicely. (Though it would've been cool to review past dialog when continuing a game.) Play Small Worlds, Coma, and Loved along with this for an interesting soul aftertaste. Even if it does share most of its gameplay elements with other Metroidvanias, I still think this is a great game. That moving camera effect is amazing. This has to be the most annoying game ever. I'm currently stuck on Camera 33. I can manage to get to the first bot but he kills you far too easily. One shot! Also I noticed at the end of this room there is a narrow passage way full of spikes, How are you suppose to get past that? Also the jump after the first bot is too high with the Jumppack(doubleJump) So is there another upgrade for this. If so were i've gone over all the rooms again and again what am I missing to gain access to a better jump and also the blaster that allows you to zap yellow doors? Great game... but I really hate the 3 minute time limit at the end. I wasn't done with everything yet, and I had to run in order to make it out. And the fact that when it runs out it doesn't kill you just makes it worse. I didn't know that, and I really don't want to play all through it again just to get 100%. Drengi, kill the robots and your problems will all be solved. Remember that they don't recharge health, so as long as you manage to plink them to death one shot at a time you'll eventually win. this game is so super metroid! Does anyone know where the jet pack is? I can't find it anywhere. I, too, am stuck in the Camera 31 red room, where you have those 2 pink doors at the bottom that can only be accessed by going underwater. When underwater, you can't jump high enough to get to those doors. What can be done? particularly the first K, in "kind"
I'm something of a completionist, so it's bugging me that I can't find it. it's "K.O.L.M." along with the letters I DID reveal, definitely got the right words across. It's "Kind of Like Metroid" was brilliant, given I was expecting something about the robot himself, actually. I love the atmosphere. I'm not very experienced with the genre as a whole, but seeing it, I'm certainly enjoying it. Does anyone know how to get the piece on Camera 32? I have double jump, but it still seems too high. MmeTurbulence, I'm thinking it might be a bug. I found an empty tablet (literally empty, it said "You found a metal tablet with '' engraved on it") and the in-game counter said I had 100% of the items, but the K in "kind" was missing and the end-game count said I only had 97%. For those who are stuck (as I was) in the Camera 31 red room with the two pink doors only accessible underwater - you need to backtrack several rooms. You'll come to one that has two pink doors; you will be returning to it from the lower left door, but you need to go through the upper left door. You'll pass through several rooms and end up in the top half of the Camera 31 room, where you get an upgrade that lets you move more freely through water. With that, it's easy to get to the two doors in the lower half. "Creepy" music? How about "atmospheric" or "moody"? There are better metroid-like games out there, but the music is probably what kept me going in this game. I simply love the atmosphere it creates. If the designer opted for a silly wah-wah tune I'd turn it off before the game even got the chance to de-blur. The escape music is the same as the 'boss' music. I was too rushed to gather my bearings and see what all my letters formed at the final screen (only 5 seconds left). I didn't imagine I'd have no opportunity once the game ended. The timer should stop once you're at the last screen. Why DON'T we have a catchy genre term for "Slightly Deranged Computer Guiding You Through A Post-Apocalyptic Test Chamber" yet? Hey, I just played through, but couldn't make it in time, but guess what? at the risk of sounding a total idiot... how do i dash jump? I've been trying for ages and i can't get it! i've got the dash but i cant get back over the spikes. @Rachel: Just dash by double tapping and holding a direction, and jump. You'll get further horizontally because you're moving faster and can get across wider pits which were impassable before. I'm stuck in Camera 26 in the lower side of the room and I can't get on the upper side and I need to go to Camera 27...help? Excellent game! I've beat it twice, but got a worse score the second time (-2400) because of lag or something that made the controls on a different computer all buggy. Speaking of the controls, no matter what, I kept wanting the 'Z' and 'X' buttons to be reversed. I always was pressing the wrong button at the wrong time and dying alot! But I never quit, because this game is so good. I don't play many online flash games, but loved Metroid, so this was a nice addition to the genre. The mood of the game is what was so compelling. Nice Job! In an updated version, please prevent the 'Q' button from sending you back to the hypersheild room during the escape. What a pain!!!!!! Also, I played once and did NOT get the letter plate in room 32, but still had 100% of items. Before I had the triple jump I assumed that it was too high to reach, so didn't try. I never went back to that room. On a side note: what is the purpose of the yellow blockade in room 19. Seems pointless in the grand scheme of things. Perhaps a diversion?!? Love it! Love the uncanny, trippy, dejavu feel -- and not because of the obvious "melacholic themes", but because of the twist or twisting at the end, or as you get deeper into the game ... how about a (VERY VERY spoiler heavy) list of "those moments"? 11. Creepy Music at the beginning -- definitely the moment in SM when I said, "wow.. this game is classy"
Song reminds me of Tales of Fantasia for NES(or SNES? )Anyway very good, creepy, and interesting. whats the word at the end spell? Can someone verify the camera 7 letter? I escaped! There is a room (not sure of the number, but you come across it extremly early in the game. it has an arrow pointing up saying "escape". if you follow it (you need all powerups), you win! @Isi in response to - Why DON'T we have a catchy genre term for "Slightly Deranged Computer Guiding You Through A Post-Apocalyptic Test Chamber" yet? 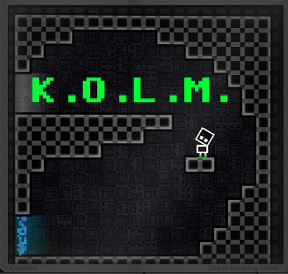 For those who know what K.O.L.M. stands for... its EXACTLY like it! down to the Hydravitor, previously seen in no other video game or computer game to date except that, and of course the whole escape from the gigantic time bomb at the end of the level concept. Furthermore, it closely resembles the first of the recent 3-D trilogy, having the red cavernous area and the green jungly area. AND WHO COULD FORGET THE DOORS? I must e missing something. How do you get to the upper-left exit in Camera 6 if you're stuck on the right? I can't get to the compression unit! Ummm did anyone else have this glitch happen? In camera 9 just after i got up from area 2, I went to get that plate and i killed the little creature from where I was going to run and jump. I failed by hitting "X" instead of "Z" so i went up to try again. I ran, jumped, crouched in midair, flew through the walls and out of the game. The camera angle kept going funny until the game screen disappeared. it was just solid black. Is it EXTREMELY laggy for anyone else? Another thing, the game itself gives a small hint in the beginning screen. The 3rd figure shows how to break the yellow force fields in the endgame. I got to the final segment and won with 100%, but on the final screen it said i only had 97%. For anyone who enjoyed the songs. even a couple years later in the day, i still found the darkness of this game--both metaphorically & visually, also soundwise--terribly appealing. i just wish the controls were a little tighter. So, I always always avoid games I think might scare me (in a BOO kind of way), and run away the moment they do. And so I rarely get jumped by games. And so I liked that since it looks like not the MOST atmospheric game (I did play it with the sound off) but it got more and more so. what do i do if i get stuck in the fan in camera 33?